We started our study of simple machines this week in preschool. The Pulleys and Machines spent the week looking at Inclined planes. We all tried to lift a crate of very heavy rocks onto a table, and despite our best efforts we could not move it. Then we tried pushing the same crate up a ramp, and to our surprise it was much easier. We did a number of other experiments with vehicles going up and down ramps and discovered that ramps can be really helpful. We also tried really hard to pour water into a bottle without spilling and found that with the help of a funnel (also an inclined plane) it too was easier. Next week we plan to talk more about ramps and wedges and how they help us with our work. The Wheels and Gears were very busy this week too: baking, visiting, and learning about -- wheels and gears! On Wednesday morning we baked pumpkin bread in anticipation of an afternoon visit with our Primary D “buddies” from the Lombard Building. When they arrived, we shared some songs and a story and enjoyed a snack of TPS pumpkin bread (the pumpkin was harvested from our very own garden!) Also this week, our colleague (and guest expert) David brought in his bicycle, parked it in the middle of our circle, and answered our very thoughtful questions about the wheels and gears on his bike. When he finished, we took turns doing observational drawings, which are now on display in the classroom. Come see! 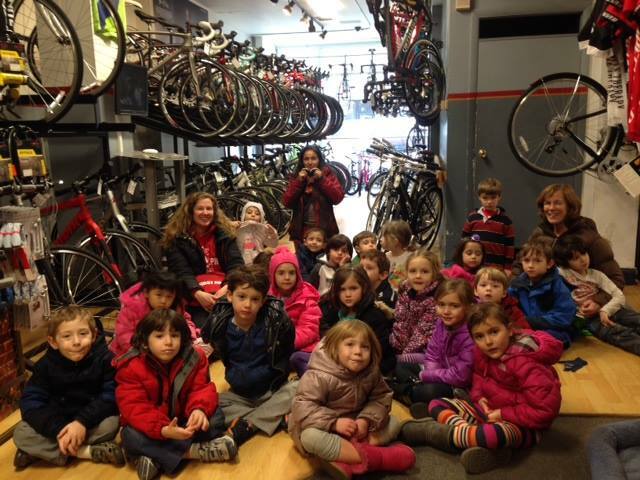 And finally, on Thursday afternoon, we took a neighborhood walk to Bicycle Therapy, a bicycle shop owned by TPS parent Lee Rogers. Again, we prepared a list of questions for Lee and toured a very real business in our neighborhood. Ask your child to tell you all about the bicycles we saw on our visit. We believe we have the makings of a very exciting project in the works . . . stay tuned for more from the Wheels and Gears! Newer PostMLK, Jr. Day of Service at TPS! Older PostOur Third Grade Environmentalists Address "People Pollution"!